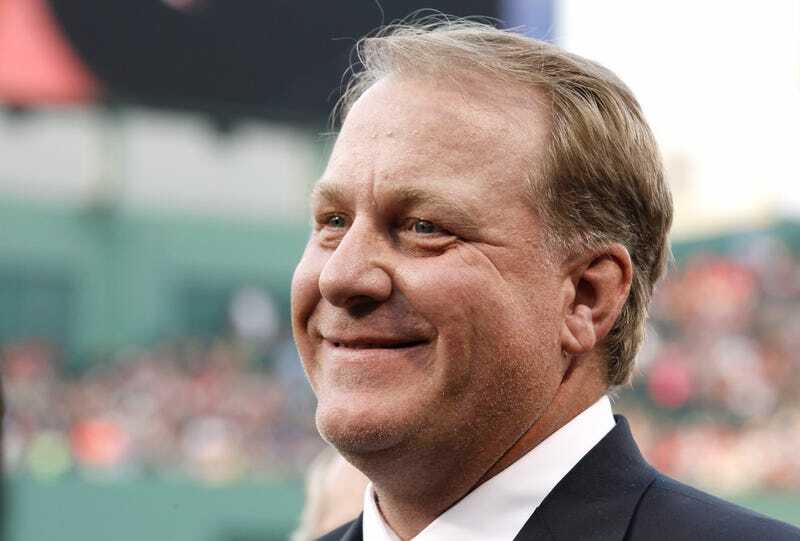 Curt Schilling Stunned By "Anger, Hatred" From "Atheists/Liberals"
Last month, Curt Schilling took to Twitter to systematically dismantle the theory of evolution. Fellow ESPNer Keith Law respectfully offered up fact-based arguments against some of Schilling's more disingenuous or ignorant claims, and was suspended by ESPN for engaging. Now, Schilling has given his first public response to the controversy. In a post on his Facebook page, Schilling parses his own words and declares he believes in microevolution—just not speciation—and expresses surprise that Law was punished for "publicly pick[ing] that fight" with him. Somehow someone made it into me not believing in the Theory of Evolution? I never said it, not even close. I said as a Christian I understand where man came from and how, regardless of whether I can imagine it, God did it, that's good enough for me. Keith Law got suspended from Twitter for publicly arguing the point I think, it certainly wasn't for his opposing view. I like Keith, just thought it odd he'd want to publicly pick that fight, though I had zero problems with it ESPN took action. I actually thought they would suspend me as well, was expecting it. But Schilling's much more concerned with the feedback he's gotten for expressing his beliefs, feedback that's been almost universally negative and comes, he says, from very specific camps. Unsure of what stunned me more, the anger, hatred and vile tweets from Atheists/Liberals, Democrats or the lack of Christians chiming in? I totally buy evolution within species, 100% as science has easily proven that. But as a Christian did people really need me to tweet that to know how I felt? Or was it the simple fact I publicly stated what anyone that knows me already knew? By the way, stunned at the language and commentary made by seemingly 'adults', scientists, teachers etc. Like they were 7 year olds on the playground again. I understand why non-believers get upset at this conversation, because many know in their hearts that if it's true their future is not in good shape. But the anger? Cussing? Every single follower I blocked had in their profile somewhere "Atheist" "Liberal" "Democrat" or some such label. The upshot of this all is that Schilling's Facebook page is a marvel, full of inspirational forwards and dad macros and politically charged stories from questionable sources. His profile photo is a bald eagle perching on a gravestone at a military cemetery, and he goes on late-night posting binges. He's America's embarrassing uncle.